Saskatoon-born, Toronto-based singer/songwriter/actress Melanie Peterson celebrated the launch of her new CD Anywhere From Here at The Piston last night, with guest artist Bri-Anne Swan opening the festivities. And what a celebration it was! Swan opened with a short solo acoustic set of mostly original songs, opening with a gorgeous interpretation of Gordon Lightfoot’s “If You Could Read My Mind.” Featuring crystal clear vocals, with a subtle haunting, wistful quality, Swan’s lyrical storytelling includes hints of folk – her latest CD Letters Home also includes a Lightfoot cover of “Now and Then” – and country (opening track “Have You Seen My Ghost”). Her sounds conjure up images of windswept, lonesome plains, big skies and misty, strange forests. Give her a listen/look-see on her YouTube channel. Bri-anne Swan is also the cover designer/photographer for Anywhere From Here. Then, the main event. I first met Melanie Peterson about two years ago, when she was performing in a line-up of amazing, talented women at ovarian cancer fundraiser She’s Listening II, and I interviewed her last year. Peterson has been described as Mary Poppins with a broken heart. The songwriting is genuine and self-aware, and there is a positive tone even in the heartbreak. In fact, the progression of the songs on Anywhere From Here – which Peterson and her band played from top to bottom – reads like the life of a romantic relationship. From the initial magic sparks in “Truth Talking” and “Fallback Plan,” to words of warning “Where There’s Smoke (Lust Ain’t Love),” to the devil may care of “Just the Right Amount of Wrong,” and into the stall in “Holding Pattern” and when it’s over in “I Miss You Already” – she’s got all the feels. There are also lovely expressions of gratitude here (“A Path Laid Out Like Gold,” featuring backing vocals by Kasandra Sharpe) and love that’s so good (“A Gift” – the CD’s title comes from these lyrics). Peterson’s sounds feature folk, pop (including a kicky Beatles-inspired riff in “Fallback Plan”) and country, with some reggae flavour (“Truth Talking”) – delivered with lovely, lilting vocals and sweet harmonies. Joining Peterson (guitar, lead vocals) last night – and also playing on Anywhere From Here: Mitch Girio (guitar, backing vocals and producer – he also produced Swan’s Letters Home), Pete Lambert (drums, violin, backing vocals) and Peter Collins (bass, backing vocals). By the time they got up to play their set, the room was packed with enthusiastic friends, family and fans – so much so that the crowd coaxed three encore songs, including “Cinema Girl” (my request – thanks again, guys!) and “Unbreakable,” from Peterson’s Unbreakable CD. Melanie Peterson’s Anywhere From Here is a heartfelt, beautiful mix of playful, introspective and melancholy. Wrap your ears around it soon. You can keep up with Peterson on Twitter, Facebook, YouTube and Soundcloud, among other platforms – see her website for all the platforms. Department of corrections: The song “Just the Right Amount of Wrong” was originally written as “Just the Right Side of Wrong” – that has been corrected and the link to the video has also been added. I was out at the Black Swan Tavern last night for the early round robin set of singer/songwriters, part of NSAI Toronto’s annual Tin Pan North music fest – featuring headliner Wendell Ferguson, with Tori Hathaway, Shaun Devlin and John Cheesman. Host Jennifer Noble, a singer/songwriter herself, introduced the songwriters and off we went on a round robin of good country sounds. Hathaway (who is 15 years old) has been busy travelling and recording, and treated us to one of the songs she’s been working on in the studio: “I’m Ready,” a sweet, poppy song about new love. Devlin’s warm, folksy storytelling style paints pictures of relationships and places – my favourite is of a couple who play bars together and are still so much in love after all these years. Cheesman has a passionate, blues-infused sound – and “I’m Not Superman,” his heartfelt ballad about a friend coming to terms with his three-year-old son’s diabetes diagnosis, brought tears to my eyes. Ferguson’s songs combine outstanding musicianship with hilarious lyrics – mostly memorably, one song warning women against marrying a musician. Tin Pan North continues today (May 24) – check out their schedule for the final day of music festivities, then get out there and support the artists. For more Think yer so Smart tunage, check it out on the Erika Werry and the Alphabet Bandcamp page. You can also find them on the CBC Music site. 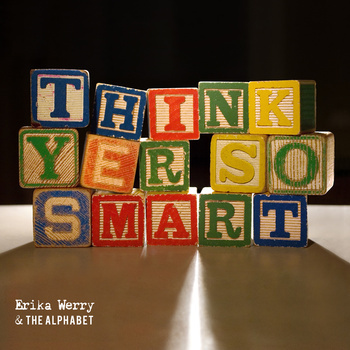 Toronto Singer/songwriter Erika Werry recently gave me a shout about her upcoming Think yer so Smart CD release, recorded by her band Erika Werry and the Alphabet and featuring co-producer Ian Blurton on guitar. While I won’t be able to make it to the April 4 release this week, I was able to give it a listen so I could tell y’all about it. The songs on Think yer so Smart move and breathe, with Werry exhaling each story with all the ache, heart and soul-searching of life – some with a driving beat, others comfy and slow – like sitting by a campfire, wrapped in a blanket. Check it out on the Erika Werry and the Alphabet Bandcamp page. You can also find them on the CBC Music site. The launch for Think yer so Smart is Thursday, April 4 at The Piston (937 Bloor St. West – near Ossington) – doors open at 9 p.m. Opening acts include Tim Vesley (who also co-produced Think yer so Smart), and Lost and Profound. Erika Werry & the Alphabet will also be premiering their music video of “What” (the opening track on the CD). Tickets can be purchased at the door only: $15 with CD or $8 without. Some cool trivia: Think yer so Smart was recorded at the Woodshed (Blue Rodeo’s studio) and the video for “What” was shot in Toronto last summer at Trinity Bellwoods Park on one of the most scorching hot days of the season. Drop on by cowbell again after April 4 – I’ll have the vid link for “What” posted.